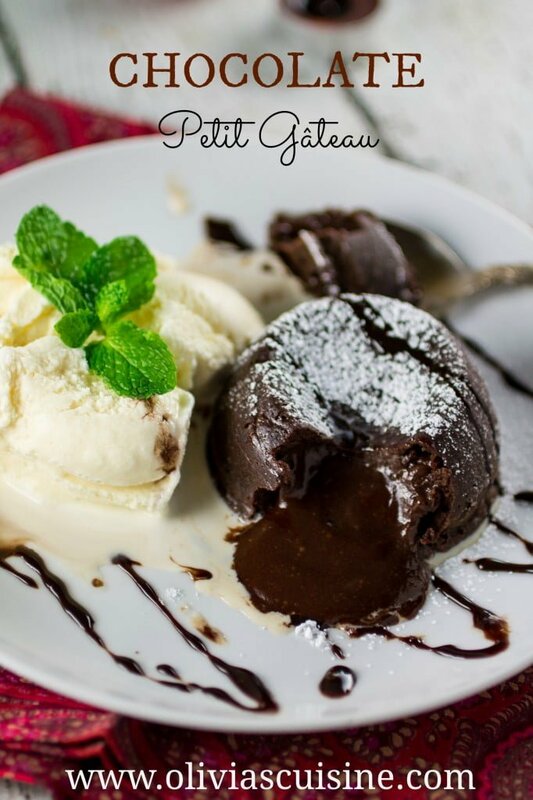 I know you probably know this dessert by the name “Lava Cake,” but I grew up calling it by its French name – Petit Gateau – so that’s how I’ll keep calling it! Also, it sounds more romantic and, therefore, more appropriate for your Valentine’s Day’s romantic dinner, doesn’t it? In a perfect world I would have all day to prep this special meal… But in reality I have to work and then get home and whip everything together in no time, otherwise we’ll be dinning at 2am. So I love quick and easy recipes like this one. It takes 10 minutes to make and it’s probably the most delicious dessert you will ever taste in your life. And no, I’m not exaggerating! Oh, and you will only need 5 ingredients… (Maybe 6 if you decided to add the cognac!) Did I just save your Valentine’s Day? You’re welcome! Send me a stuffed animal! Petit Gâteau in French means “small cake” and that’s exactly what it is. A small cake that has a crunchy rind but a soft and creamy filling, usually accompanied by some vanilla ice cream. The traditional one is made with chocolate, but many other flavors came after that, like dulce de leche, lemon, orange, white chocolate, guava, coffee and even savory versions. The legend says that this dessert was created because of a mistake. Apparently in the 90’s a French chef – based in New York City at the time – didn’t add enough flour to the cake and also took it out of the oven too soon. And because of that we have this “raw” filling that is the main characteristic of this cake. This sweet treat became very popular in New York and, consequently, in the rest of the world. I have a cousin that has a theory that you can order a petit gateau in pretty much every restaurant in the world. Of course, he’s totally overstating… But the point is everybody loves this little beautiful cake! Oh, so now I got your attention? 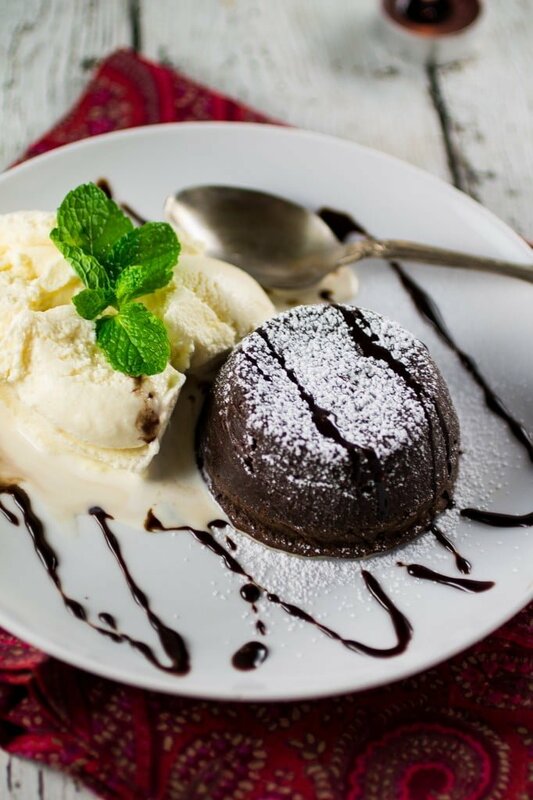 :) Believe me, this dessert wins hearts in one bite. If you feel like you won’t want to interrupt your romantic dinner to make dessert, even though it is only 10 minutes, you can totally make it ahead of time and freeze them and then only thaw and pop them in the 500 degrees oven for 5 minutes. The only thing is that it won’t be as lava-y (Yes, I just made a word!) inside! But still delicious, I promise. So what are you guys cooking for Valentine’s Day? Or are you going out to a fancy restaurant? I would love to hear your plans! Find two pots where one will fit into the other. Fill the big one halfway with water and put the little pot (preferably a saucepan) into the bigger pot. Bring them to the stove and heat them until the water boils, while you make the rest of the recipe. While the water is heating, add the eggs to a bowl and beat them with a whisk. Add the sugar and the flour and beat everything together until well incorporated. Reserve. When the water starts boiling, add the chocolate - in pieces - to the small pot and keep stirring with a spoon until the chocolate melts. This is called melting the chocolate in bain marie. Once the chocolate is melted, take the small pot from the big pot and set it on the counter. Add the butter and whisk until the butter is melted. Then, add the egg/sugar/flour mixture and whisk until you have something resembling a liquidy dough. Add the cognac, if using. Fill pre-greased ramekins with dough, 2/3 full. Bring the ramekins to the pre heated oven, for 5 minutes or until the cakes set on the outside, just enough to hold their shapes. Take the ramekins out of the oven and let them cool for a few minutes. Being careful so you don’t burn yourself and handling them with care so you don’t break them, turn the cakes upside down on the individual plates where you’re serving them. Serve them hot with vanilla ice cream. You can also decorate with sprinkled confectioners sugar, fruits (like raspberries), mint, chocolate syrup, etc. If you don’t have ramekins, you can use a cupcake tin. haha…no I am not organized at all..I just happened to make this cake a month back but didn’t get around posting it..so thought will post around V day..else I am a mess always! Hi Olivia, are you Brazilian too? I am going to try your recipe for the first time today. My boyfriend loves and I want to make it at home. Keep in touch. Amazing, my friend!! I will never call it Lava Cake, again! Petit Gateau it is!! I need to have this – NOW!! 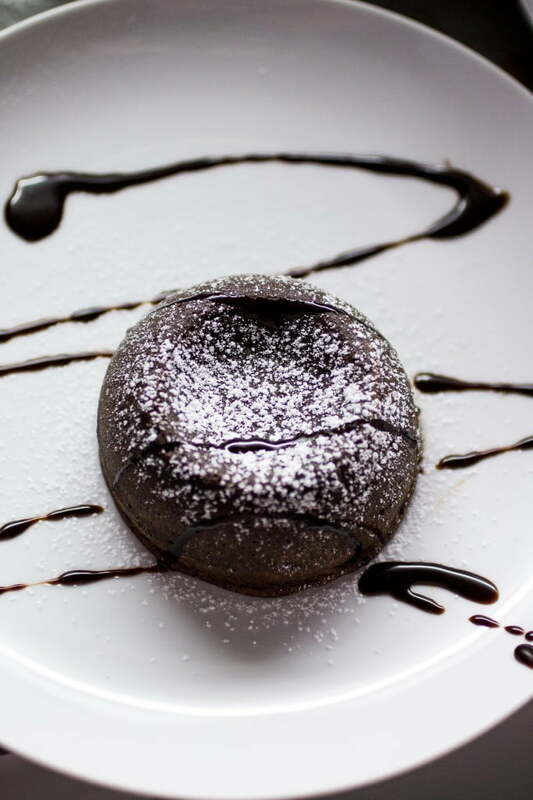 Lava cakes are just about the best desserts EVER! I love this recipe, Olivia! I always order these whenever I see them on restaurant menus. 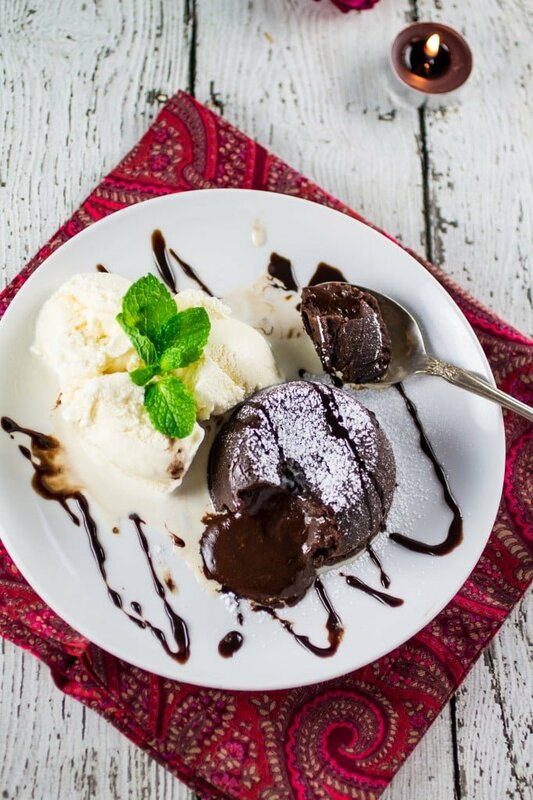 What a perfect dessert! This dessert looks fantastic Olivia! Never thought I can make it at home! Pinned and will make it for Valentine’s day! This looks so decadent and lovely. And warm, which is perfect for this season. My husband and I cook a stirfry and enjoy a bottle of Duckhorn Merlot every V-day. This will be our 10th year (11? hmm) of doing this! That’s so nice! I love traditions!!! :) And a stir fry sounds like a great idea for V-day! Hi Carolina! The temperature is in Fahrenheit! :) It’s about 260 degrees in Celsius. I hope that helps! Tava lendo tua recipe pq tava a procura de inspirações pra fazer petit gateau pq aqui na Califórnia Bay Area é difícil de encontrar em restaurante e depois que fui ver que és brasileira! Parabéns pelo blog!! Can you make them ahead and warm them when eating? Quick question…. is the butter in this recipe salted or unsalted? From paraguay, I tasted this delicious dessert in brazil and want to re create it….